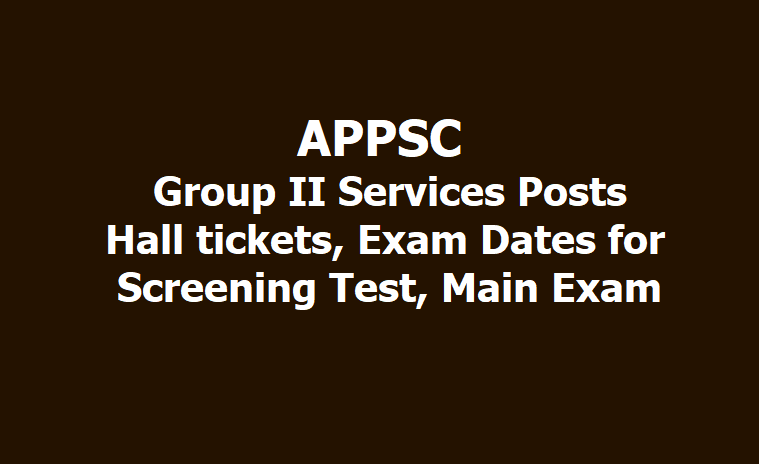 APPSC Group-II Services Posts Hall tickets, Exam Dates 2019. APPSC Group-II Services Posts Screening Test Date and APPSC Group-II Services Posts Main Exam Date 2019: APPSC issued the APPSC Group-II Services Posts Recruitment 2019 notification and Andhra Pradesh Public Service Commission invited the online applications from the eligible and interested candidates for recruitment to the Group-II Services Posts in A.P. The Andhra Pradesh Public Service Commission (APPSC) will conduct group 2 services exam in May. The Commission has modified the exam dates "owing to administrative exigencies." As per the new schedule, the preliminary test for Group 2 service exam is scheduled to be held on May 05. The Commission conducts screening test only when the number of applicants exceeds 25,000. While a total of 446 vacancies have been notified by the Commission for the group 2 services. The selection of candidates for appointment to the posts shall be based on the merit in the Main Written examination (Conventional) followed by oral test (Interview). The main exam for group 2 services will be held on July 18 and 19. The exams will be held at 13 exam centres: Srikakulam, East Godavari, Vishakhapatnam, Vizianagaram, West Godavari, Krishna, Guntur, Prakasam, Nellore, Chittoor, Kadapa, Anantapuramu and Kurnool. Andhra Pradesh Public Service Commission (APPSC) will release the admit card /hall ticket of APPSC Group-II Services Posts Screening Test on 05.05.2019 FN and After Andhra Pradesh Public Service Commission (APPSC) will release the admit card /hall ticket of APPSC Group-II Services Posts Main examination on 18.07.2019 FN & AN and 19.07.2019 FN. APPSC Group-II Services Posts Screening Test hall tickets: The APPSC Group-II Services Posts Screening Test hall tickets to be available on the official website https://psc.ap.gov.in/. Candidates who applied for Group-II Services Posts recruitment examination can visit the official website to check and download APPSC Group-II Services Posts hall ticket 2019 for Screening Test. The candidates need to enter their user ID and mobile number to access the hall ticket. APPSC Group-II Services Posts Main Exam hall tickets: The APPSC Group-II Services Posts Main Exam hall tickets would be available on the official website https://psc.ap.gov.in/. Candidates who have qualified in Group-II Services Posts recruitment Screening Test can visit the official website to check and download APPSC Group-II Services Posts hall ticket 2019 for Main Exam. The candidates need to enter their user ID and mobile number to access the hall ticket. Check your Details: After downloading the admit card, the candidates should carefully check all the details such as name of candidate, roll number, registration number, date, time, venue of exam, exam day instructions and other relevant details. In case, there is any mismatch in the data, the same should be informed to the concerned authorities immediately for corrections. On the day of the exam(Screening Test / Main Exam), the candidates need to carry admit card along with photo ID proof such as Aadhaar card, passport, PAN card, Voter ID card, driving license, identity card issued by Government for employees etc. The APPSC conducts Group-II Services Posts Recruitment examination to recruit candidates for the Group-II Services Posts in A.P. Revised Exam Scheduled in Group-II Services Posts - Notification No.20/2018 - Screening Test to be held on Screening Test on 05.05.2019 FN. and The Main Examination will be as scheduled on 18.07.2019 FN & AN and 19.07.2019 FN. APPSC is going to conduct the Screening Test for Group-II Services Posts Recruitment and which will be held on Screening Test on 05.05.2019 FN. APPSC is going to conduct the Main Exam for Group-II Services Posts Recruitment and which will be held on 18.07.2019 FN & AN and 19.07.2019 FN. Candidates can download the Hall tickets from the Official Website. HALL TICKETS: Hall tickets can be downloaded whenever the Commission uploads them to its website. Intimation would be given through the website regarding downloading of Hall Tickets. 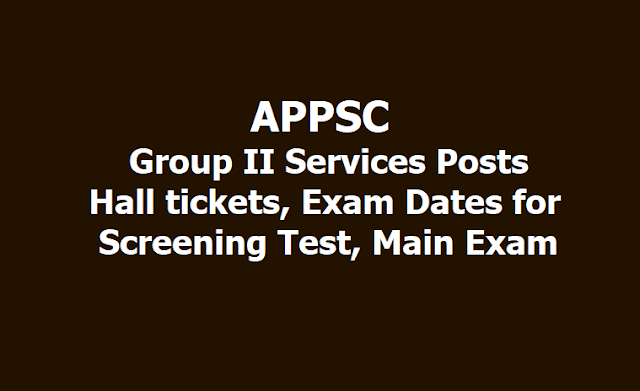 APPSC Group-II Services Posts Hall Ticket: How to download? Step I: Go to official website for APPSC: www.psc.ap.gov.in. Step II: Click on the hall ticket download link given on the home page. Step III: Enter the required details. Step IV: Submit and download your admit card. APPSC conducts a screening test if the number of applicants exceeds more than 25,000. Candidates who qualify in the screening test will appear for the main examination which will be a computer-based test.